The kind of bass you get from factory speakers is never enough. It can even be more annoying when listening to music with worn-out speakers. It makes the entire car audio experience so undesirable that you would rather have the system turned off instead of getting annoyed by low-quality sound.Moreover, most factory speakers are very basic in terms of power and performance. They’re only designed for a basic listening experience but not something enjoyable. Actually, they would never win a car music competition.However, you don’t have to give up all your in-car entertainment because of some wear and tear or low-quality factory speakers. You can enhance your car audio experience by investing in one of the best 6x9 speakers. 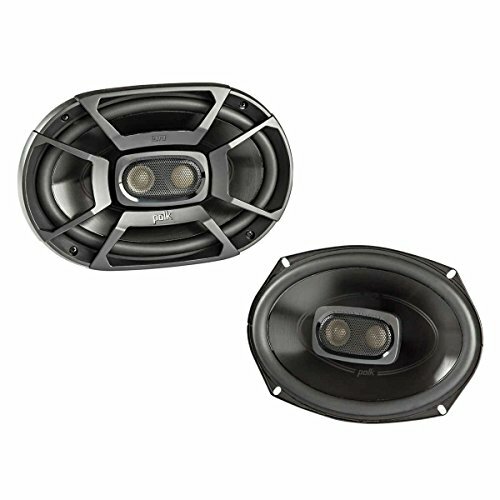 Investing in aftermarket speakers will take your car audio system to a whole new level. Selecting one speaker model from the hundreds of almost identical models isn’t a walk in the park. Our review team (composed of audio experts, researchers, technicians and real users) spent tens of hours evaluating the specs of each of the 6X9 speakers on the market for comparison purposes. The researchers painstakingly skimmed through information from reliable sources such as real customer reviews on eCommerce and other authority sites. Audio experts tested the speakers for audio performance, power-handling, and sensitivity among other technical aspects. 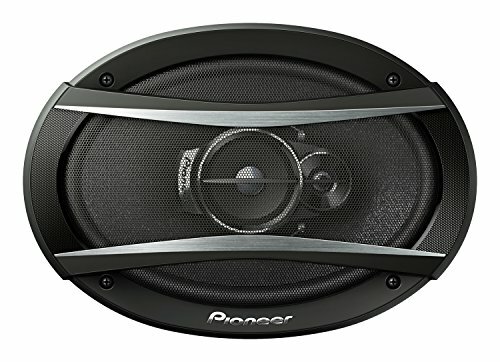 The A-Series of Pioneer speakers stroke our curiosity because it is reputed with providing a combination of great audio quality, excellent power handling capacity and loudness. The TS-A6996R model takes on this legacy, featuring a high-quality mica woofer and a soft-dome tweeter that deliver an accurate response for a pleasurable driving experience. A rigid multilayer mica matrix cone revives your hope for quality sound production. This cone structure provides wider sound dispersion thus delivers better audio performance when playing any kind of audio on your playlist. Lovers of deep bass kicks such as hip hop, alternative rock and dubstep should definitely try out the TS-A6996R. A hard, lightweight, and rigid plastic in the diaphragm explains why Pioneer TS-A6996R is ranked among excellent performers for their incredible sound propagation. The diaphragm is structured with your love for deep beats in mind as it allows for powerful sound reproduction and enhances the sensitivity and responsiveness of the speaker. The Pioneer brand knows the secret behind improved frequencies across all ranges. This is evidenced by the use of a high-quality soft-dome tweeter that comes with a wave guide to ensure that that the speaker gives you optimized sound at high volumes. Expect total uniformity and smoothness in the sound waves emitted by these speakers. To ice the cake, Pioneer TS-A6996R sports the new spider design that every high-end component speaker brand is adopting. This design allows for stiffer suspension and a flawless on and off-axis response that creates an ambient atmosphere inside the car for total enjoyment of every ride. Other features include a cooling basket for better heat management and more efficient power handling. You also get a fully covered mesh grill that protects the interior of this fantastic entertainment buddy from physical damage. The Pioneer TS-A6996R speaker set was the best performer based on overall audio quality. Its continuous power-handling capacity was outstanding. For more volume and more pronounced bass, pick Pioneer TS-A6996R. Try out Pioneer TS-A6996R for absolute fidelity to your music sources. If you want that sonic upgrade to your car so bad but you are on a budget, the Rockford Fosgate R169X3 is quite favorable – it’s priced under $50. The high-quality materials used to make this speaker promise you nothing less than cleaner and more powerful audio performance as well as enhanced durability. It’s designed with a stiff, high-performance polypropylene cone with rubber surround that can handle strong frequency waves without getting damaged. You will enjoy bolder bass notes from these speakers, and clean and pleasant mid-range waves will always be your company when you drive. Real users have ticked this model as a no-distortion speaker and the source of this credit is its two tweeters (a silk dome tweeter and a piezo super tweeter). Car tweeters facilitate clear dispersion of sound which assures you an exceptionally strong high-frequency response and sound without the slightest trace of harshness. A built-in crossover network is integrated in the design to efficiently divide frequencies heading to the separate drivers. This is a great space, time and money saving feature as there is no need for manual crossover adjustments which would otherwise add an extra expense and make the set more complicated. 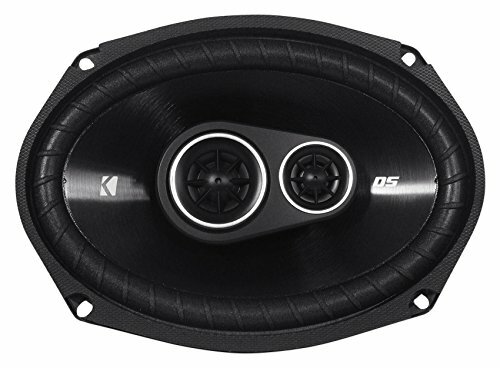 Here’s where the Rockford Fosgate R169X3 beats many speaker models: its ease of installation. The speaker assumes a pretty simple structure that merges different driver components inside one device. Complete installation is as simple as connecting a few wires, screwing the speakers, and there you are dancing to your tunes. 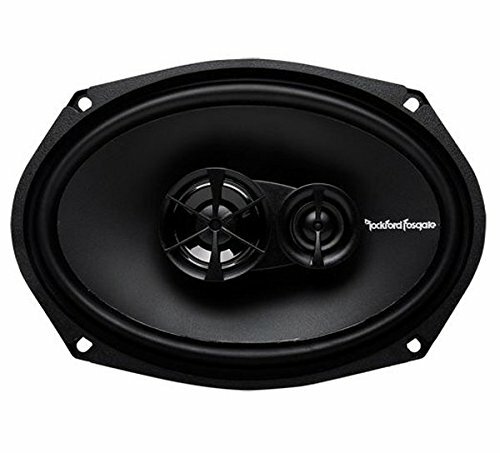 Rockford Fosgate R169X3 ranks as a high-quality speaker for car doors. It’s favorably priced and it could be the best offer for an above-average performance coaxial speaker. Check out R169X3 on Amazon and see how it fits your car stereo needs. 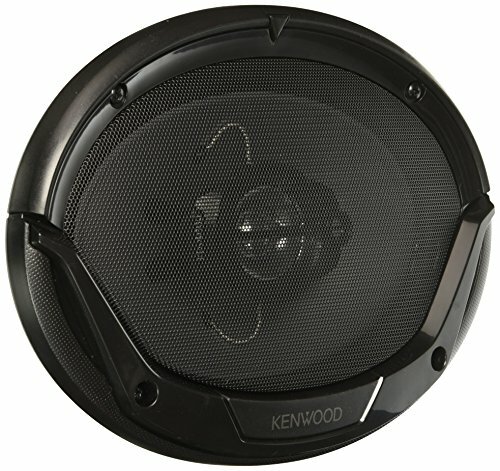 Talk of strong 3-way speakers and Kenwood’s KFC-6995S comes up first. These speakers open up your sound stage and deliver accurate tunes from any music source. The speakers are highly power-efficient and work well either with aftermarket or stock radio power. Their 45 watts RMS allows you to add an amp for bigger and better sound. A highly-durable polypropylene woofer and a treated cloth surround are the hallmark of this speaker set. No matter the temperature or humidity conditions in the car, your KFC-6965S will keep pumping out high-quality bass and exciting treble supported by the speaker’s 400W maximum power output. Two tweeters - a 2-inch PEI cone tweeter and a half-inch ceramic super tweeter are fitted for smooth transition between highs and mids (frequency range response all the way from 30Hz - 22,000). You will be amazed at the precision with which these speakers render high-quality sound all frequency limits. The speakers use ferrite magnets – they can withstand temperatures within the range of -40 to 250 degrees. They are also rust and chemical resistant; meaning that you can comfortably use the speaker in a wide range of environments.This feature places the Kenwood KFC-6965S ahead of the pack of most durable speakers. The speaker comes in a sleek black color and the silver finish surrounding the treble give your audio system an elegant appearance. Whether you want to give your car’s interior a better look or are aiming your audio upgrade at making the car more presentable for sale, Kenwood KFC-6965S will not let you down. A black, sturdy, steel basket is delivered in the package, functioning as a shield for the internal components of the speaker to avoid their damage. You can be sure to enjoy great quality sound for a longer period this time as this compact speaker will last longer than your previous speakers. Do you need a fantastic speaker set for the front of your car? The KFC-6965S speakers are a high-quality, budget-friendly and durable upgrade for your audio system. When you get a chance to try the KFC-6965S speaker, don’t hesitate to take it! A polypropylene, UV Tolerant woofer cone coupled with a strong rubber surround provides solid playback and utmost resilience when the speaker is in use. Certainly, your Polk highly versatile speakers will ever exhibit great audio performance whether you are driving, cycling or boating. Receive all your tunes with awe as the two silk dome tweeters fitted in Polk Audio DB692 will deliver highs with exemplary precision and invigorate the sound stage for sweet delivery of all tunes. These tweeters enable your system to reproduce high tones to the most accurate sound details. A built-in crossover network amply keeps highs and lows flowing to the right drivers. Better sound imaging is the ultimate benefit of efficient isolation of frequencies to different components (which can only happen when there are crossovers in the system). Their effect is felt through improvement of the speakers’ overall quality of sound. Power handling of up to 150W RMS makes it possible to drive the speaker system with a wide range of aftermarket receivers. You can also make things juicier by powering your Polk DB692 with an amp. With its power handling ability, it will surely give you bigger and more thrilling sound. Strongly built grills add nice flare to your car’s interior. Should you want to do a custom installation, this Polk model is a great choice for a premium-grade speaker set to upgrade your car audio. Polk DB692 is amazingly versatile that fits any automobile. This feature, coupled with excellent sound performance and durability, makes the speakervery attractive to car and boat owners. Pick Polk DB 692 and enjoy traveling with your tunes everywhere you go. Rockford Fosgate appears again in our list to emphasize the brand’s commitment to sonic excellence. Punch P1692 is a powerful full-range speaker designed for those who love soul-awakening music. With 60Hz - 22 kHz frequency response and 91dB sensitivity the speaker stands out among other brands due to its performance. The speaker is constructed with FlexFit basket design that has fastening holes instead of slots for mounting. This design allows you to install the speakers on the gaps left by factory speakers, and you can also mount them on any vehicle model. Mineral-filled and polypropylene injection molded woofer cone with butyl rubber surround make a powerful combination for quick response and great sound production. 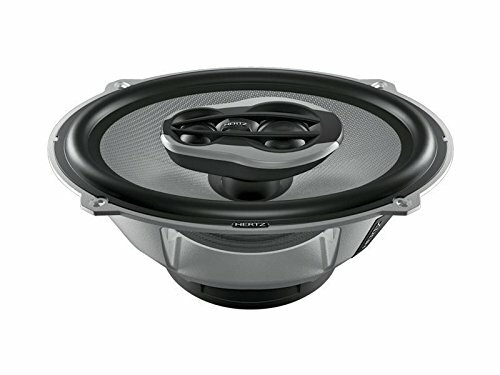 This woofer cone material is among the best for loud music so if you are longing to crank up your music, the P1692 model of Rockford Fosgate is here for you. Innovation at its best in the speaker construction: the Vertical Attach Sound Technique (VAST) is used - a new technique of attaching the surround to the cone. The technique increases the affective radiating area of the speaker by 25%. As a result, the speaker gives you fuller sound and stronger booms. Your Rockford Fosgate ably handles highs using its ¾-inch PEI dome tweeter. A frequency response range of 60HZ to 22 kHz allows the speaker to give out extended highs effortlessly. You hear a touch of clarity across the entire frequency range as your audio plays out at any volume. 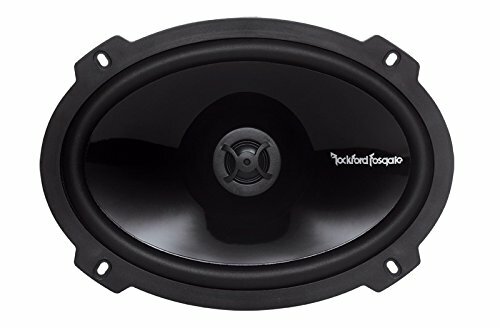 Rockford Fosgate Punch P1692 earned a place among the top 6x9 speakers because they are powerful, impressively compact and easily mounted on any type of vehicle. Consider fitting this speaker into your car doors for bigger, clearer and more precise sound in your car. 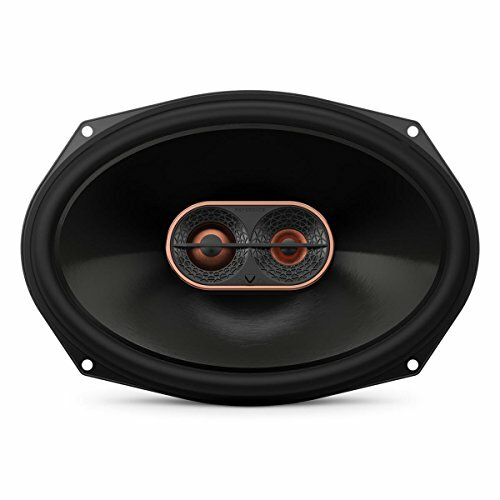 These speaker champions boast of high-quality construction where an over-sized neodymium magnet and a pure copper voice coil are fitted for powerful sound reproduction. The magnet offers excellent control and the voice coil has superior mechanical ability. That’s the secret behind Hertz speakers not getting overheated even after giving out audiophile-type sound for hours. A die-cast aluminum basket supports all elements of the speaker – all of which are designed with maximum heat dissipation abilities. This ensures that the speaker lasts longer while producing high-quality sound continuously even at frequency ranges as low as 32Hz and an impedance of 4 ohms. The speaker is packed with a woofer designed with damped mesh fiber cone that enables more accurate response, and a polymer surround that responds efficiently to the music source. Together, the mesh fiber cone and polymer surround give awesomely accurate response and produces the best melody out of any song. A tweeter and super tweeter are added into the speaker’s design to create a pleasantly detailed midrange. You are set to enjoy smooth highs without any trace of distortion regardless of whether the volume is cranked up. With these sound beasts, only the local authority will tell you to tune it down. It carries a premium price but you can be sure it’s worth the dough. 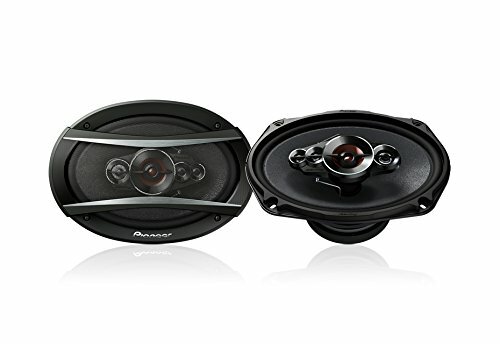 These 3-way speakers are a great option for individuals looking for a reputable brand to boost car audio sonic abilities at a very reasonable cost. Handling up to 420W MAX power, these speakers provide a high ceiling for sound volume. You can complement them with an amp to unleash the audiophile in you. A Dual-Layer Injection Molded Matrix aramid/basalt fiber composite cone makes Pioneer the first speaker brand to introduce a woofer cone designed from natural rock. The cone is extremely rigid and is a great absorbent; an attribute that enables the speaker to produce stabilized sound waves and withstand wide temperature ranges. Arching wave guides and a V-shaped tweeter diaphragm allows for smooth off-axis response. Over-sized soft dome tweeters emit enjoyable highs and the special wave guides help to control sound dispersion so that everyone inside the car can enjoy great music. High-quality built-in crossovers (12dB/Octave HPF and LPF crossover) boost sound wave transition from mid to high frequency. This allows for smoother mid-range to tweeter response and improved definition of vocals and instruments in your jams. Thick metal basket and rear chamber tweeter enclosure ensure maximum protection of your speaker system and improve vocal imaging and staging. The sealed rear chamber effectively extends mid-range frequencies while the extra thick metallic basket acts as a dampener to diminish vibrations and resonances that may be produced by the woofer. The speaker, through its rigid woofer cone, delivers a satisfying punch. The extra midrange driver allows for improved isolation of guitar riffs, bass lines, powerful drums and vocals. Check out the Pioneer TS-A6966R speaker on Amazon while stock lasts. A 2-inch polypropylene woofer surrounded by ribbed polyester foam transforms sound from the source to the loudest and most detailed audio you can get from Kicker. Tune your music to any volume and vary frequency as you like, your Kicker 43DSC69304 drivers remain faithful to giving you the best listening experience. In a successful attempt to eliminate hoarseness from your audio, Kicker included a half-inch PEI domed tweeter and a super tweeter in the system. The super tweeter is meant to handle higher frequencies in the spectrum in a better way and belt out the high-frequency details with more clarity and ambience. Kicker 43DSC69304 work with all head-units. If you have a low-powered unit, the speaker’s high-sensitivity motor in is used to drive the woofer enables for production of satisfactory sound volume. If the system has an add-on amp the motor can also handle higher power to give you the higher kick you have been missing. The woofers feature a thin design to comfortably fit in the car door without obstructing car window mechanisms. Thus, the Kicker 43DSC69304 speaker, carrying with it MAX Power of 360W, 70W RMS power and 92dB sensitivity rating per speaker pair provide a powerful yet hustle less drop-in car audio upgrade over factory sound. If all you want is crisp sound with decently produced bass notes but are on a tight budget, this new Kicker will enable you to kick your car audio a notch higher. New Kicker 43DSC69304 goes at a very competitive price on Amazon; it’s worth checking. People who have tried out different car speakers know that there’s something special about “the Infinity sound”. The Infinity REF-9623ix 3-way speakers will realize you dream of smoother, clear highs and deeper and more powerful bass. Install the speaker on any location in any car and you’ll get the best sound from these uniquely designed speakers. Big woofer cones are specifically used in the engineering (Plus One technology) to add more punch to your jams. The strong high-roll rubber surrounding the cone supports the accurate delivery of lows and significantly improves the sound reproduction abilities of the speakers. You can tune your highs at your pleasure any time since the speakers come with edge-driven textile tweeters with an adjustable tweeter output level. Whether you want to fit your Infinity REF-9623ix into the dash, on the doors, or back, the speaker will sound great as you can optimize the system’s linearity however you like. The power handling capability of this Infinity speaker leaves you with all the options for improving sound quality. Whether you use a factory/aftermarket stereo with or without an amplifier, the speaker’s 100 RMS power provides absolute flexibility in power supply options. Infinity REF-9623i gives out more volume than its impedance rating by using the True Four Ohm Technology. The speaker’s 3-ohm impedance combines with the speaker wire’s impedance to give your stereo actual 4-ohm impedance. This is an innovative method used by the competitive speaker brands to enable you enjoy more than what you pay for. The Infinity REF-9623ix model was designed with every car driver in mind. It is an easy-to-install prime speaker that guarantees high quality sound and minimal distortion. Jump onto Amazon and bring on board the REF-9623ix into your car for prime driving experiences. The Polk Audio DB691 6-by-9-Inch 3-Way Speakers are the last but not the least in terms of its performance. They are decorated with composite cone made of polymer and mica which is surrounded by rubber. These Wonderful Speakers have an 1″ inch liquid-cooled silk-polymer dome tweeter that gives you crisp high notes. Experience resilient and distortion-free sound production from the 1.25-inch low-weight ASV voice coil used to build this heavy-duty speaker. The coil can handle high temperature for increased performance and efficiency to allow you play your tunes for long hours even in high temperatures environments. For the delivery of rich and well-balanced sound, Pyle PL6984BL designers coupled a poly injection woofer cone with a rigid,non-fatiguing butyl rubber surround. This assures you that you will enjoy high-quality sound for a longer time and you have peace of mind knowing that the cone is fully protected by the rubber surround. Pyle PL6984BL speaker is made more powerful than its predecessors by the use of a 50-Oz magnet combined with two high-quality tweeters (one being a super tweeter) and a one-inch neodymium film dome. It’s thus able to comfortably deliver a frequency response range of 50Hz – 20KHz and provide impressive sound all the time. Its blue, eye-catching poly injection cone not only promises you powerful reproduction of sound but also a cool, more refreshed look of your car’s interior. Sometimes you need to just relax in your car and consume the awesomeness of rich audio; these speakers can transform your car into an enticing chilling zone. The ease of installing these gems is unbelievable. They are delivered with mounting hardware and additional wires so that once you put your hands on them, it will only take you a few minutes to complete the installation. A grill is also provided for increased protection of the system against physical damage. 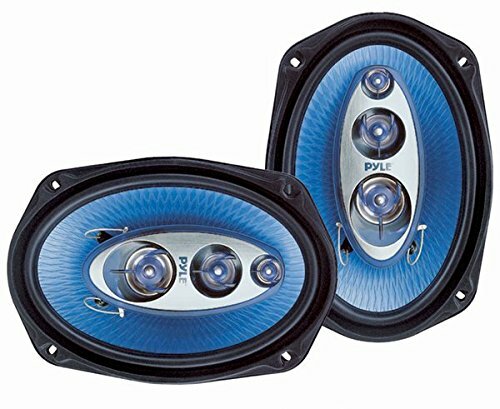 Why choose Pyle PL6984BL speakers? Pyle PL6984BL speakers areoutstanding in their great look, sturdy build and powerful performance. It is the best-sounding speaker among its peers (price-wise peers) and also ranks well among other highly-priced speakers. Once you set your eyes on the beautiful curves of Pyle PL6984BL and its price tag, you will want to have then there and then. We are almost done with our hunt for the best 6X9 speakers. Now get out your list of requirements. What’s your main objective of doing a sonic upgrade on your car stereo? Maybe you are just so tired of hearing awful sound from your factory speakers and need them out as soon as possible. But you cannot replace them with any speaker otherwise you risk making what could turn out to be an expensive mistake. Consider speakers that produce the full spectrum of audio – bass/lows, mid, and highs. 3-way speakers, like most of the speakers reviewed above provide awesome grades of music across the spectrum and significantly add sheer entertainment into your driving experience. Speakers with excellent bass make installation of subwoofers unnecessary. Therefore, if you are planning your upgrade under a tight budget, you can consider speakers that deliver clean midrange and highs without any bass bleed. The best speaker for improved sound quality exhibits clarity throughout the spectrum. To test this quality, you can listen keenly to sibilant (those with hissing sounds) songs playing to identify if there is any harshness in the audio. High-performance speakers don’t have any distortion of sound even when bass is turned up. The midrange is clear of any bass bleed and there’s smooth transition across different frequencies. Any speaker that has a sensitivity rating above 87dB can be considered a good option when choosing the best speakers. A high sensitivity means the audio will be loud enough to outdo noise from the road as well as noise from idle conversations while one is driving. Of course, you want music or audio with high-quality volume as you travel. For those who like moderate volume, coaxial speakers can be a great pick. There are many coaxial speakers in the top speakers list so you can find one that is compatible with your car’s interior design to experience improved volume quality. Tweeters: The best 6X9 speakers come with high-quality tweeters. As you do your search, check for the size, shape and material of the tweeters. In most cases, ceramic, dome-shaped, well-balanced tweeters contribute to the delivery of a great tone and a likeable melody. Woofer material: Speakers with woofer materials that are stiff but lightweight such as polypropylene, mica, woven fabrics, or metal coated synthetics are the best materials for great frequency response and better bass. These materials also hold up well in differing conditions such in extreme temperatures and humidity. Surround material: The surround’s role in sound production is to facilitate free movement of the woofer and to emit a bold bass. The material used in most high-performance speakers is rubber but other cheaper alternatives like cloth and foam also perform well as surround materials. Evaluate the speakers reviewed above with respect to your list of requirements. Record performance on sound clarity, volume, smoothness, speaker price, etc. then sum up the marks and pick your winner. Your selection process should be simpler now as each speaker featured in our 10 best speakers review fulfilled the requirements of most of the real users that participated in our research. The speaker has high-quality features that provide a satisfactory upgrade to all aspects of sound quality – audio quality, clarity, volume, and sensitivity. Many users reviewed it as the most favorably-priced speaker with a guaranteed capability of improving sound quality. It has a great design that makes the car’s appearance better. You can choose whichever speaker that provides what you want from your upgraded stereo system.An important point to note is that price is not always an indicator of quality or performance. There are speaker brands that generally command a higher price tag but you should look into every speaker’s features and benefits to make sure you get the best (in terms of functionality) out of your investment.